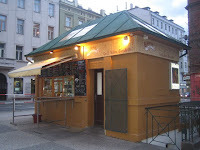 I heard the bad news earlier this week from a reader -- Bohemia Bagel Express at Tylovo náměstí is closing today. I stopped by for a steak sandwich on Wednesday and the man behind the counter confirmed the news. And an article in the Prague Daily Monitor today fills in the sad details. It's a shame because they had good prices, a decent burger, steak sandwich, and chicken salad, and I could grab something on the way to work. What they say about the importance of location is true. If the little food shack had only been on the other side of the park, next to the tram stops, it all might have turned out different. Too bad I just wrote a long post about them so recently. And another one more than a year ago. Now, those posts get a "closing" tag, along with Bohemia Bagel at Újezd, Fuzion Cafe, Dinitz Cafe, Alexander's, Tiger Tiger, Valetta, and Picante. Quite a list of casualties over the last 20 months or so. Tough times out there in restaurant land. Very ironic. I just made my first stop at Bohemia Bagel Express 20 minutes ago - specifically because of your first blog post. Damn it. Two times I went by last week and wanted a hamburger, but it was late and they had no meat. Goodbye cheap burger. Tiger2 and Picante were both run by greedy bastards and deserved to close. At least you'll still have the other Bagel locations to grab their stuff. Is there now actually any place where you can get a cheap burger? And McD is not an option. Oh, no! I really loved stopping by there for their chicken salad sandwiches. How disappointing.